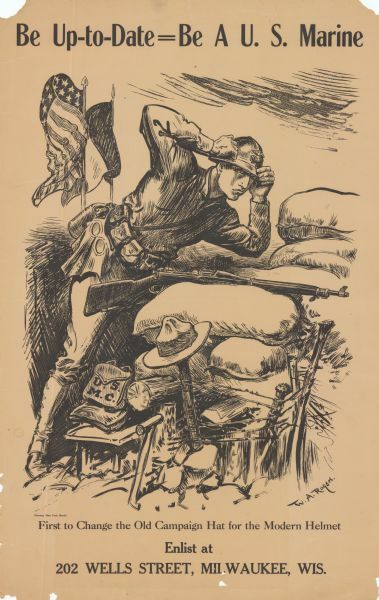 Poster featuring an illustration of a soldier with his gear, adjusting his helmet while standing behind sandbags. On his belt is a gas mask. Poster text reads: "Be Up-To-Date = Be A U.S. Marine. First to Change the Old Campaign Hat for the Modern Helmet. Enlist at 202 Wells Street, Milwaukee, Wis."
Illustration signed by William Allen Rogers.